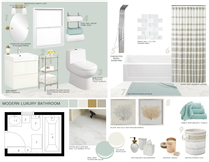 We would love for the bathroom remodel to be modern & sleek. 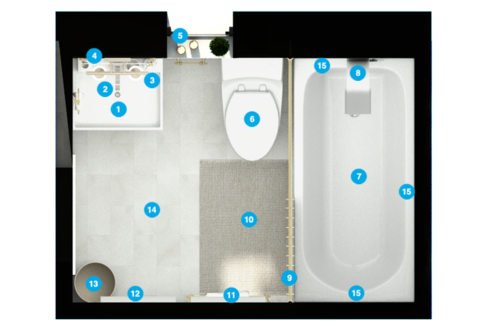 The bathroom is really small so it doesn't have enough space for anything else other then what should be in there. I definitely want to replace the shower no sliding door. Prefer a regular bath with a shower curtain. Replace the floors, mirror, & light. This is basically a complete remodel changing cabinets and all. 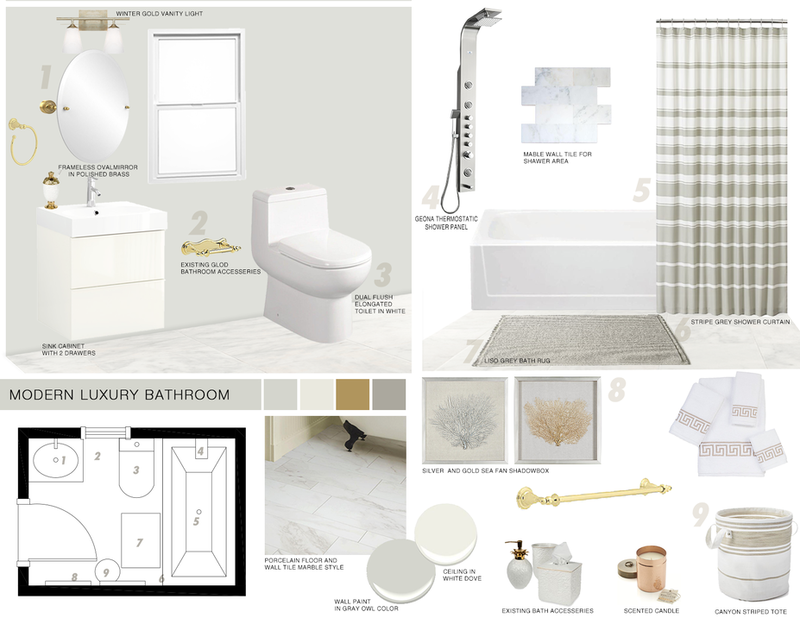 I bought some gold bathroom accessories so I would love to incorporate gold in my design. Every handle and such should be gold. The tile, the cabinets, tub, flooring, the sliding door is not wanted, the wall color--everything needs to be completed redone. Just the bathroom set. Pictures are attached. This is just amazing! Everything I wanted. I really do love everything! Thanks so much. Use a semi-gloss paint finish as it is ideal for bathrooms and cabinets. It has a slight shine and is easy to clean. Liso Grey Bath Rug (217014) Simple, soft and substantial our stonewashed cotton bath rug soaks up water while providing a splash of room-freshening color. Discount link available to project holder only 21"x34"
Quantity: 84 Grecian white is a natural stone marble that illustrates a classical romance. Smooth polished surface of this tile has trendy soft white tones that exude chic elegance. 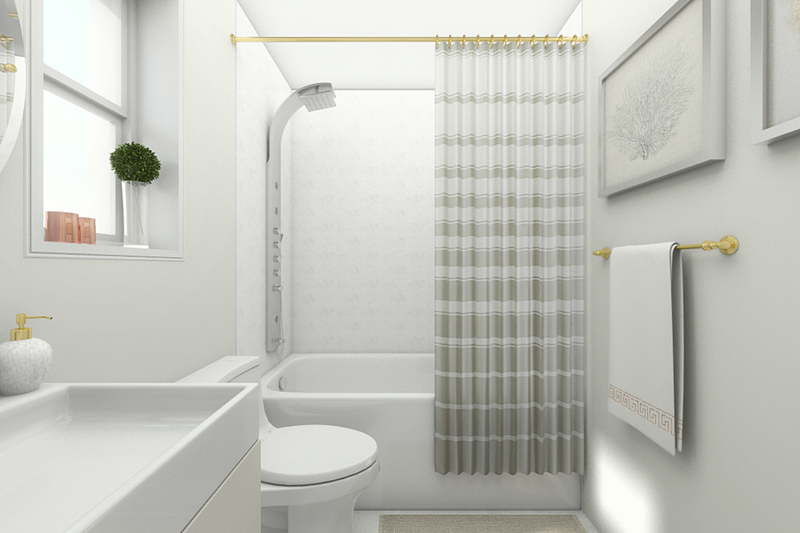 With a large selection of sizes and accessories to choose from, Grecian white can easily be laid in a pattern or single layout. NOTE: Inspect all tiles before installation. Natural stone products inherently lack uniformity and are subject to variation in color, shade, finish, etc. It is recommended to blend tiles from different boxes when installing. Natural stones may be characterized by dry seams and pits that are often filled. The filling can work its way out and it may be necessary to refill these voids as part of a normal maintenance procedure. All natural stone products should be sealed with a penetrating sealer. After installation, vendor disclaims any liabilities. Discount link available to project holder only 3" x 6"
Heavy Duty Metal Roller Decorative Shower Curtain Rings Hooks Hanger,Set of 12 (Polished Brass,Honla) Set of 12 are made of prime quality materials - brass and stainless steel Heavy duty finish process to ensure lifetime of product Rolls friction resistant across your shower curtain rod Polished nickel plated to ensure durability and lifetime of finish Designed to Fit 1" and 3/4" diameter curved or straight shower rods Discount link available to project holder only 3/4"Di. Dynasty Hardware DYN-SR72-PB 1-Inch Diameter Shower Curtain Rod And Mounting Brackets, 72-Inch (Polished Brass) Set includes: shower rod, wall flange pair & mounting hardware 6' long (2-piece), 1" diameter, heavy gauge solid brass tubing Matching wall flanges: 2-3/4" diameter concealed mounting, solid die-cast zinc alloy Shower rod can be cut to length with pipe cutter or hacksaw When assembled the rod is a smooth to allow easy shower curtain opening and closing Discount link available to project holder only 2.75" x 72"